I believe all of us have our own favourite hawker food. Food that we grew up with and food that hold special memories for us. 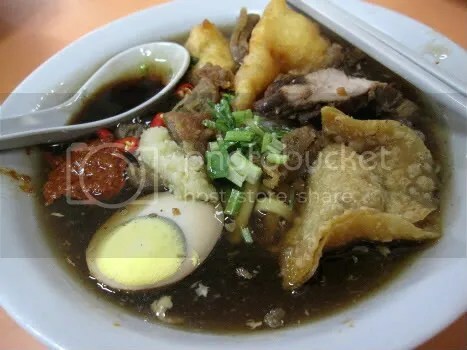 My favourite hawker meal is a bowl of piping hot lor mee, drizzled with loads of extra black vinegar and accompanied with a spoonful of diced garlic. Such a deceptively common dish has received many differing interpretations by different hawkers. Some add starch to their soup base to give that sticky starchy consistency while others prefer the keep it more watered down. Hawkers also differentiate themselves by the ingredients they add into their lor mee. We Singaporeans are really spoilt for choice! Soon Heng Food Delights is pretty popular, judging by the long snaking queues on the sunday afternoon we were there. They sell fried, battered shark meat (gasp!) as well. Dad was quite bent on buying it but thank goodness it wasn’t available that day. The lor mee itself had a truckload of ingredients. Loved the battered fish especially. Lots of white meat inside instead of the measly silvers that we get sometimes. The amount of noodles given was quite little (enough for me but i’m a small eater) for a $3 bowl so you might want to ask for more noodles. I remember being less impressed by the soup base, but the myraid of ingredients added made me pay less attention to it. All in all, definitely worth a try if you are in the vicinity. What I was really looking forward to though was the famous Annie’s peanut ice kachang. It came in a huge mound that trust me, was even bigger before she compressed it. 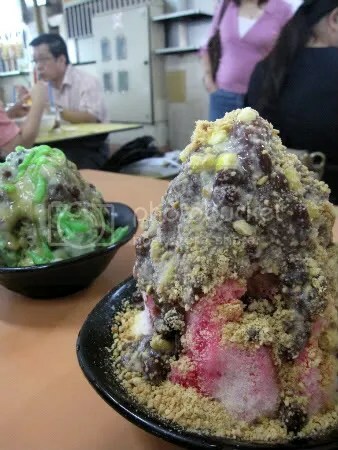 The distinctive part of her ice kachang would be the powdered peanut, showered all over the colorful mound of ice flavoured with syrups. I was quite disappointed by the disproportionate amount of syrup and ingredients added to such a ginormous mound of ice. Other than that, the shaved ice was perfect. I never had ice that was shaved so finely before! If you do order this, please ask her to add more of everything. I believe this will incur a top-up but i bet it’ll be well worth it! To me, the pièce de résistance is instead her Durian chendol. The durian sauce and chunky red bean are heaped generously all over the comparatively smaller ball of ice with the finishing touches of those pastel green flour noodles we see in the traditional chendol. 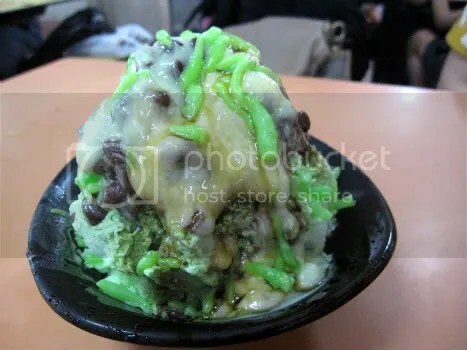 Just like how i love the chendol snow ice from Mei Hong Yuan, I love this reinterpretation from Annie’s as well. For whatever reason, I like all reinterpretations of chendol but the real thing!